What is a Bone Age? Bone age is helpful in assessing a child who is shorter or taller than predicted based on parent heights or if a child has early or late pubertal changes. It’s simply an x-ray of the child’s hand and wrist. It involves minimal radiation and doesn’t hurt. The bone age can help us approximate how much longer a child will grow and the expected height, but does not tell us why a child is shorter or taller than expected or hitting puberty at an unexpected age. Bone age is difficult to understand, and I hope this helps parents understand with some pictures. I completely made up these growth charts. They do not reflect any real patient or any real diagnosis. They are solely to illustrate how we estimate the bone age on the growth chart to help assess final predicted height. The reasons behind altered growth patterns are many and might require further evaluation. A delayed bone age means that the bones think they are younger than the child actually is. This can mean catch up growth after peers have stopped growing. A delayed bone age can happen for many reasons, but a common one is due to late puberty and can run in families. A history, physical exam and possibly labs can help asses the reason for delayed bone age. If a child has an advanced bone age it means the bones appear older than the child’s actual age. With this we expect them to stop growing earlier than most kids. This means that even if they are tall for their age, they could end up shorter than average. Advance bone age is often associated with early puberty and childhood obesity. An advanced bone age needs further evaluation to identify the cause. If the bone age equals the actual age, you can estimate the final height to be about the same percentage as the current height. We often repeat bone ages to see if they are changing at a different rate than the child grows. How’s a bone age determined? 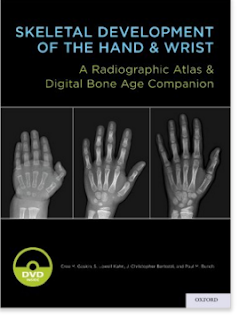 Radiologists and endocrinologists use books with x-rays of standard bones of various age groups to assess which age the child’s x-ray most closely resembles. Since there are different bones that can develop at different rates, it is possible that two doctors will assign a different bone age. It is not an exact science, but can give a good estimate of how much longer a child may grow. The photo above is from Amazon’s bookstore. You can see how the bones of the youngest hand on the left are very different from those in the hand on the right. The radiologist or endocrinologist finds the image that is most like the child’s x-ray and call it that bone age. In the boy growth charts pictured below, the top set of lines is the height (stature) for age chart. The bottom set is the weight chart. Hopefully these looks familiar because you’ve seen a graph like this at your child’s doctor. If you haven’t, be sure to ask to see it next time you’re there. The ages that are used to plot a height and weight at a given time are listed at the top and bottom. The heights and weights are listed on the right and left of the respective graph. I only marked the height graphs for the purpose of this blog. The middle line is 50%, which reflects a height of 50% (taller than half/shorter than half of boys of the same age). The other lines are also labeled for their respective height percentiles on the far right. What is normal on a height chart? There are many “normal” heights, usually determined by genetics. Tall parents tend to have tall kids, short parents have short kids. There is no “correct” height or “best” height, the percentiles simply give us a way to follow the growth over time and estimate final adult height if a child hits puberty at a typical age (early puberty stops the growth early, late puberty allows for later growth). In Figure 1, I filled in a fictitious child’s heights with blue dots. You can see that from 3 to 5 years this boy was at the 50th percentile for height. That means he was taller than half the boys his age and shorter than half. The fact that he’s in the middle doesn’t make it “normal” it just means that if his parents are average height, he is growing as expected because it’s consistent year to year and he is of average height like his parents. At 6 years, he dropped to the 25th percentile, and at 8 years he fell to the 10th percentile. This consistent drop in growth often triggers a physician to look for reasons of the drop. The red arrow on the right marks the actual height at 8 years (blue) at about 47 inches (120cm). For this fictitious child, the bone age is 7 years, and if you plot 47 inches (the actual height at the time) at 7 years (the bone age), you will see this white dot is at the 50th percentile and marked by the red arrow on the left. I finished out the growth plots, and this kiddo actually fell more (down to the 5th percentile) before he hit a late puberty and grew into late teens/early 20s to hit a final height at the 50th percentile. Maybe the parents are both very short. A delay in bone age often coincides with a late growth spurt. A late puberty often follows a family pattern called constitutional growth delay. It could be due to a medical problem, such as a hormonal imbalance. Sometimes there is a family history of people having late growth spurts (called “constitutional growth delay”). Treatment (if needed) varies depending on the cause. The bone age won’t give a cause, but once a cause is identified and treated, growth often returns to a normal rate. In Figure 2 below, a fictitious boy is tall for his age early on. 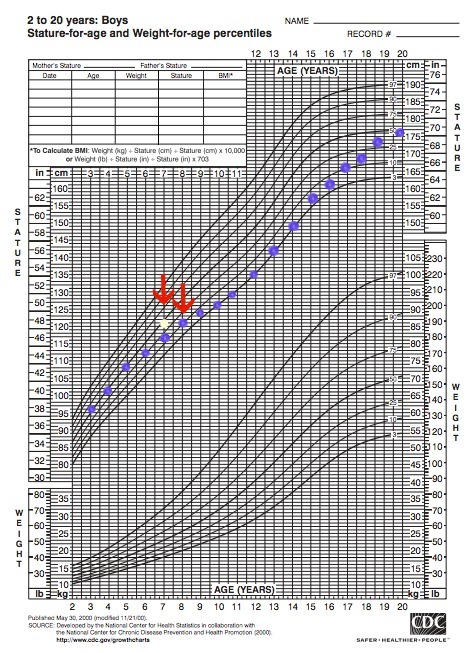 At 6 years old his height (black dot) is at the 97th percentile (he is taller than 97 out of 100 of boys his age) at about 49.5 inches (125.5cm). 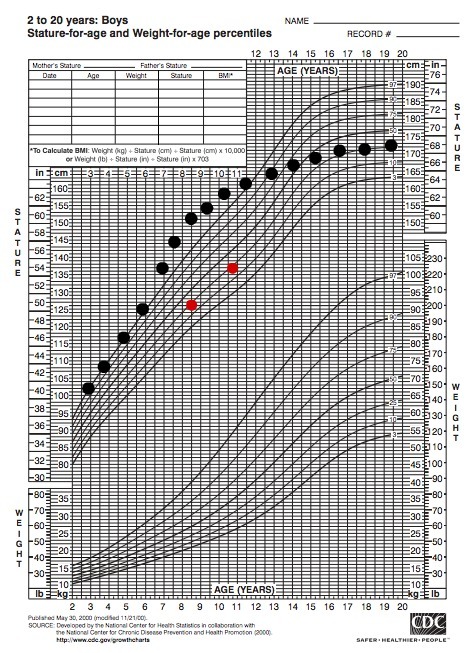 His bone age at the time (red dot) is 8 years 6 months, which is at the 25th percentile for height. A year later he is off the height chart, taller than over 97% of boys his age, but the bone age is 10 years 9 months, again at the 25th percentile. This chart shows an early growth spurt (as he looks taller than his peers) but an early puberty and a slowed growth faster than other boys. His final height is only at the 25th percentile, much shorter than his early heights would have predicted. Many parents are super excited when their children are tall and can’t comprehend when I talk about the possibility that it might not last. I typically discuss this if both parents are short but the child is tall, if I see signs of early puberty, or if the child is obese – especially if parents are not as tall as the child’s height predicts. The bone age does not give a reason for the altered growth rate, but can help identify a need for further evaluation and treatment if indicated. Yearly well visits – even when kids are healthy! Unexpected growth problems is one very important reason to do yearly well visits at your child’s primary care office. If you move physician offices for whatever reason, be sure to have the medical records transferred before your first visit. This allows your child’s growth to be properly followed. If you do a sports physical at a school clinic or an urgent care, realize that it is not a substitute for a yearly visit in your child’s medical home. At every well visit your child should have a height and weight measured and discussed with you. If the yearly growth accelerates too fast or slows, talk to your doctor about possible reasons. If a bone age is done, you can use a growth chart to estimate the bone age. This allows you to see how tall the final height estimate would be. It is also the reason to do the x-ray soon after your child’s height was measured. Waiting a few months requires another visit to look at the height at the time of the x-ray. Yearly tracking isn’t a guarantee that your child will grow to his or her potential, but can be helpful in identifying problems early. Next Next post: Measles Outbreaks: What can you do to protect your family?